For some reason, 2014 is still the most popular year with 9% more visitors than in 2015 and 3% more than in 2016. The blog post with the most hits in these three years is still my completely off-topic review of Luzia Simons’s and Sarah Jones’s flower photography, probably due to reasons outlined in my 2nd anniversary post. However, its number of hits is declining from year to year, while the second most popular post, on Erwin Panofsky, is on the rise. The post with the 3rd most hits is the one on Heinrich Wölfflin, which makes me like to think that people might be interested in this whole ‘theory in comics’ series. So maybe I’ll write some more of this stuff this year. Most visitors come from the US, followed by Germany. So far, so predictable, but what baffles me is that Germany is closely followed by France (UK on 4th place, Canada on 5th). There has been almost twice as much traffic from France than from the UK! By far the most requested image is gay young Ozymandias and his “… aquaintance” from Before Watchmen. Apart from image links, most outward traffic from The 650-Cent Plague goes to www.manganet.de, the website of German publisher Egmont Manga (which they seem to have changed to http://www.egmont-manga.de recently). In contrast to e.g. Marvel and DC, their manga series URLs are relatively stable, so I don’t hesitate to include them in manga reviews. What will I write about at The 650-Cent Plague in the future? Well, is there anything you would like to read here? Tell me in the comments! This 14,6 × 21 cm, 15-page manga leaflet is available for free at the ropeway station on Miyajima island. It’s the third part of a four-part story, but from what I gather, the manga is about a girl named Aki who visits several sights on Miyajima and runs into supernatural beings. Time travel might also play a role – the Japanese title on the cover says, 弥山へ。。。時の旅人, “time traveller to Misen” (Mt. Misen is the mountain on Miyajima to which the ropeway goes). Compared to regular, professional manga, the artwork might be a bit amateurish, but it’s still significantly better than what you would expect from what is essentially an advertisement comic issued by the Miyajima Ropeway company and created by locals from Hiroshima (writer: Yatarō Ichimonji, artist: Hitomi). So this is the thing around which the whole manga industry revolves: the manga magazine. More precisely, this is a copy of the June 16 issue of 週刊ヤングジャンプ / Weekly Young Jump. 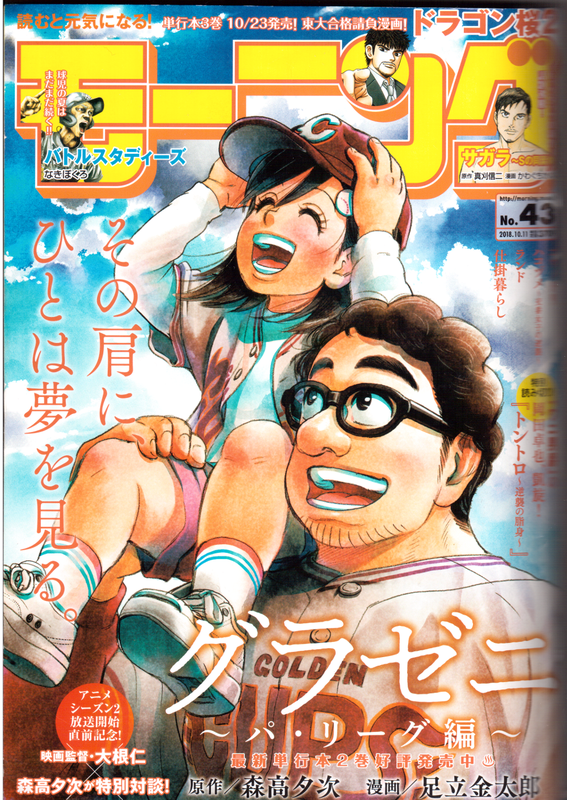 Not quite as legendary as 週刊少年ジャンプ / Weekly Shōnen Jump by the same publisher, it is still a venerable manga anthology magazine that is sold at every convenience store. Manga magazines are often said to be ‘phone book sized’, but that’s only true for the bigger monthly magazines. The smaller weekly ones like Young Jump are staple bound, measuring ‘only’ approximately 25,5 × 17 × 2 cm. This also means that the paper format is about 1.5 times larger than a tankobon. The most obvious difference between Young Jump and Shōnen Jump is the ‘gravure idol’ on the cover of the former, advertising photo pages of young women in underwear at the beginning (in this issue: Anna Iriyama from AKB48, 8 pages) and end (Yūna Ego from SKE48, 6 pages) of the magazine. In other words, the cover is not representative of 97% of the content. A page from Legend of the Galactic Heroes by Ryu Fujisaki. The poor printing shows particularly in panels with large black areas. 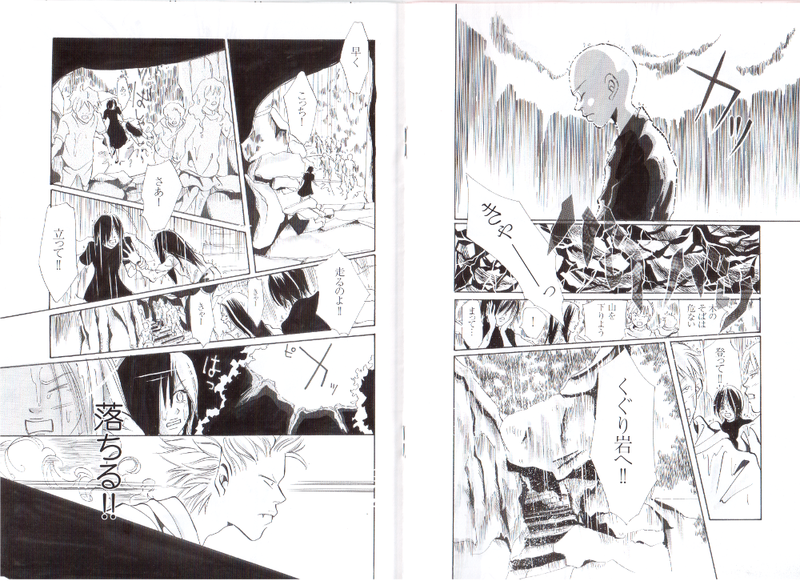 As for the manga pages, their printing quality really is abysmal – light grey ink on white paper, resembling printouts when the toner is about to run out, and guaranteed to come off on your hands. But most of the time it’s good enough to let you figure out what’s going on in the drawings. 君と１００回目の恋 / one hundred times I was fallin’ in love with you by Chocolate Records, Inabaseri and Kumichi Yoshizuki, a manga to promote an upcoming teenage pop music film of the same name. 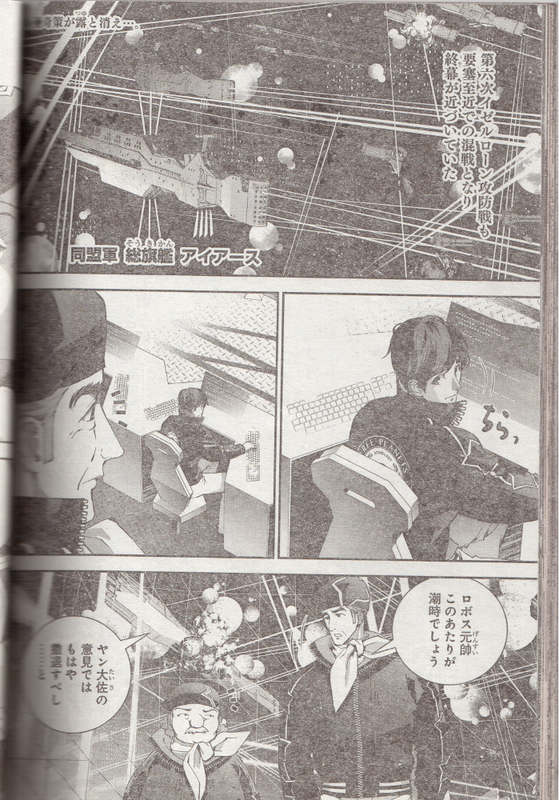 In the past, Weekly Young Jump ran such famous series as Gantz, Elfen Lied, Liar Game, and All You Need Is Kill. Thanks to manga magazines like Weekly Young Jump, manga readers in Japan (in contrast to most of those outside Japan) can decide whether to buy these and get their cheap ‘weekly (or monthly) fix’, or to ‘wait for the trade’ which is more expensive and of a smaller format but of a higher printing quality. Of course, the manga industry wants readers to first buy the magazines, then discard them and buy the tankobon too. This is an exhibition I stumbled upon by accident: until January 31, Somerset House hosts a small Tintin show. It focuses on the black-and-white era and features some original drawings – or, more precisely, facsimiles thereof. While I don’t see the point of going to an exhibition to see facsimiles, I guess they can still be interesting if you’re interested in Hergé’s production process. There is one exhibit I found fascinating though: the sports page of the Le Soir newspaper from April 15, 1944, which contains a 4-panel strip from the Tintin story Les Sept Boules de Cristal. The diminutive format of this strip – approximately 20 by 5 cm -, which might be due to wartime paper shortage, is amazing. Even if French-speaking readers were able to read Tintin comics in a much larger format after the war in its own magazine, the tiny Le Soir version was the original one that was read by probably hundreds of thousands of people. If you happen to be in London anyway, it can’t hurt stopping by Somerset House to see the exhibition – admission is free, after all. For everyone else, getting the exhibition catalogue (authored by Pierre Sterckx and translated by Michael Farr) might be the better alternative. Almost exactly four years ago, DC Comics cancelled all their monthly comic book series, just to relaunch most of them again as ‘The New 52’. I hesitate to call this a proper reboot, for reasons I have discussed here before. Anyway, now (in May/June) they have done the same thing once again, at last dropping the ‘New 52’ label: approximately half of the monthly series was cancelled, while the other half was renumbered to #1. 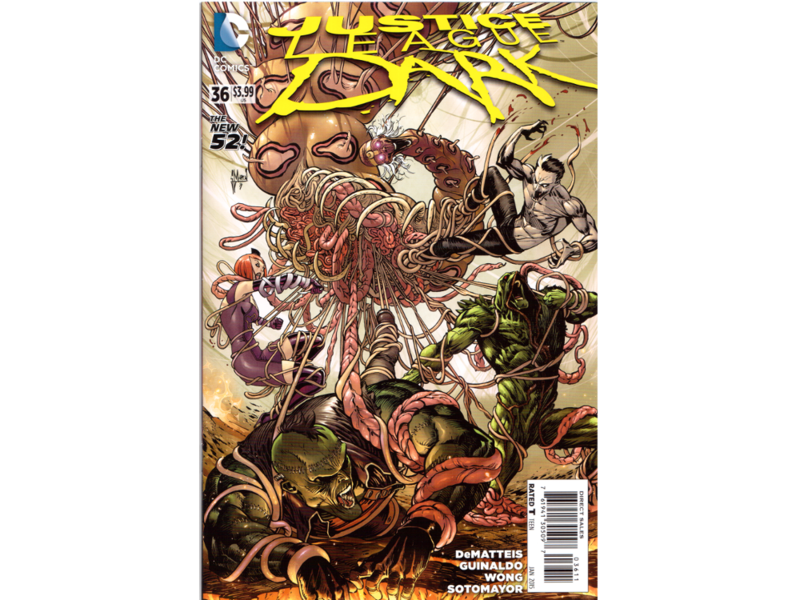 Several other weblogs have taken a look back at the 3 1/2 years of The New 52, among which I particularly recommend Steve Foxe’s “In Loving Memory: All 68 DC Comics That Have Come and Gone Within the New 52” at Paste. The general consensus seems to be that The New 52 was a bold marketing decision that may have made sense commercially, but in terms of the quality of the actual comics, not much really stood out. If I get Foxe right, 93 ongoing series had been launched at some point during The New 52. Out of these, 25 have been relaunched and continued to the present day, while approximately 47 were cancelled already before this latest relaunch (i.e. after the ‘Convergence’ crossover event). The former consist of mainstays such as Batman and Action Comics, while among the latter we find mainly obscure oddities that were probably doomed from their very beginning, e.g. G.I. Combat or All-Star Western. This leaves us with ~21 titles that sit in the middle, having made it to their 40th issue, but not being continued in this new iteration of the DC comics line. From a commercial perspective, these comic books seem to have ultimately failed too. But wasn’t there something in them that might be worth remembering? Didn’t all the effort that creators put into them amount to more than a mere footnote in the history of American superhero comics? With this question in mind I re-read all 40 issues (plus Annuals and the like) of Justice League Dark, the only New 52 series I happened to have collected from start to finish. (More precisely, I started from #9, then got the first trade paperback and #7-8 later.) 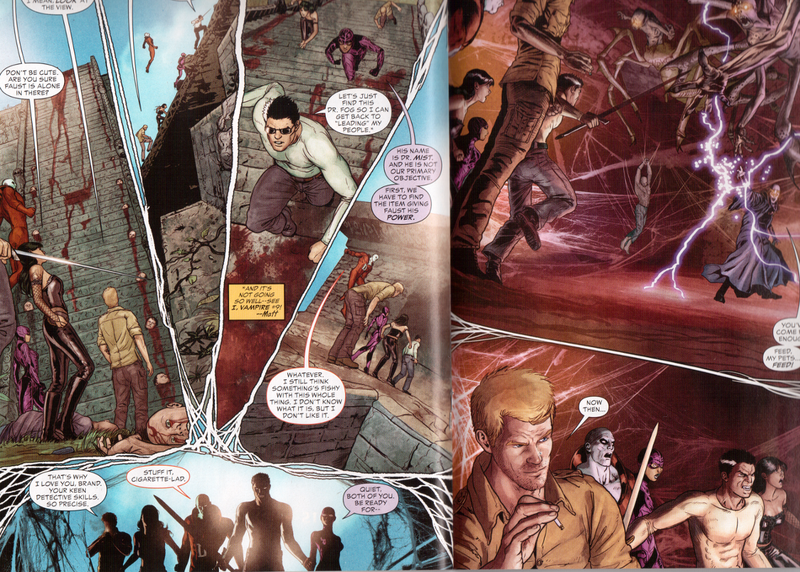 Instead of summarising the story, I picked the following 20 most memorable moments in Justice League Dark, in chronological order of publishing, to show that this series (and probably others with mediocre sales performances) might deserve a second look. 1. JLD #1 The very first issue (by Peter Milligan (w) / Mikel Janin (a) / Ulises Arreola (c)) is already full of brilliant ideas. Take the opening page, for instance: Madame Xanadu sits there and seems to look at the reader, while her tarot cards float around the room, some of them face-up towards the picture surface for the reader to see. (This is a composition that refers to earlier ones, two of them pictured in the Madame Xanadu Wikipedia Article.) The tarot cards show who be the protagonists of this first story will be: Deadman, Enchantress, Mindwarp (who actually turns out to not play much of a role), Constantine, June Moone, and Zatanna. The cards are labeled with the traditional tarot card names – ‘The Magician’, ‘The Fool’, ‘Death’, etc. What better way to start a story? 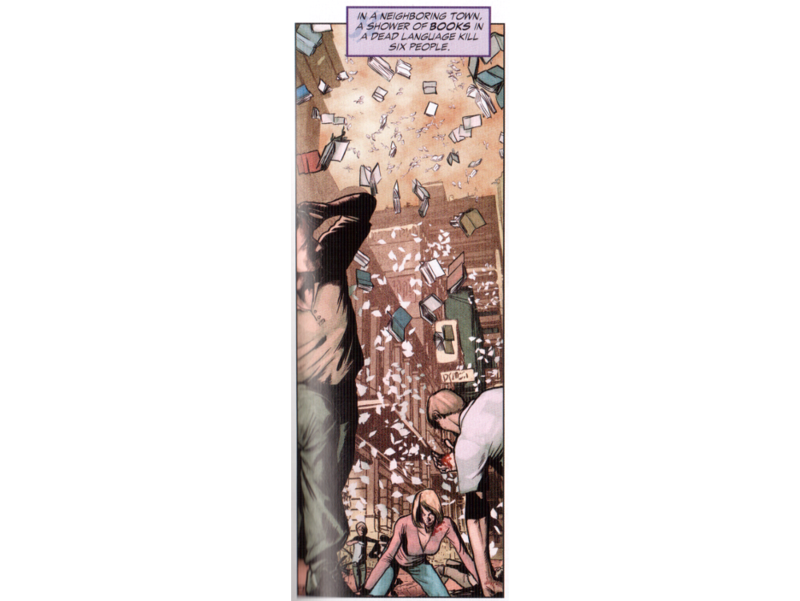 You could even argue that the cards are on a different diegetic level and only there for the reader – after all, why and how would Madame Xanadu make such a tarot deck? Then again, the cards are shown several more times in the story and seen by other characters too. 2. JLD #1 Peter Milligan lend a dark sense of humour to his stories that neither Jeff Lemire nor J. M. DeMatteis, Milligan’s successors as writer of the book, ever accomplished. In this issue, supernatural phenomena suddenly occur, most of them only briefly told in one panel. My favourite one has the following caption text: “In a neighboring town, a shower of books in a dead language kill six people.” Get it? “Dead”? “Kill”? 3. JLD #1 Generally, Peter Milligan’s version of the Justice League Dark was much darker than that of the writers that followed. Almost all of our ‘heroes’ are shown to have a dark side. Madame Xanadu, for instance – otherwise a rather bland character – is shown to be addicted to some kind of drug. “How much of this stuff are you doing?”, she is asked by Shade, holding a phial in his hand. 4. JLD #2 In the first few issues, Milligan needs to introduce a lot of characters, and he does a brilliant job of it when it comes to Deadman. Deadman is a ghost, and the only way he can touch and be touched is to possess a living person. Things get awkward when he wants to do that to sleep with his girlfriend, who is not so keen (“You’re asking me to sleep with another man”). 5. JLD #5 What all JLD writers emphasise is that the JLD is quite a fragile superhero team. 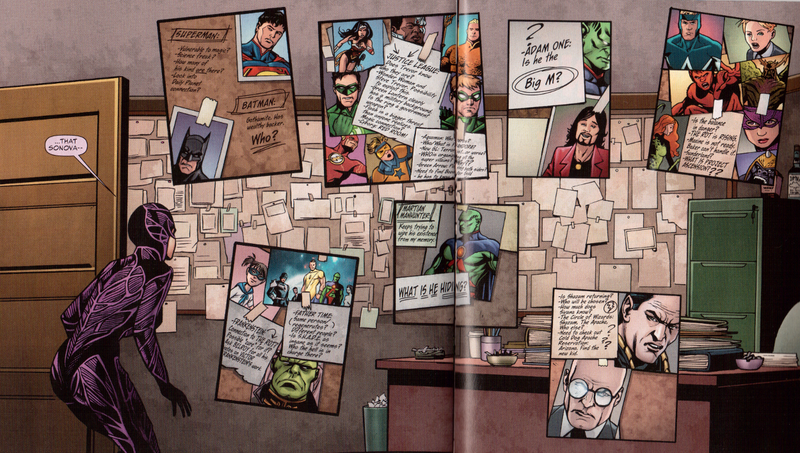 Consequently, the first break-up of the JLD already happens in the fifth issue (and it’s not going to be the last). “I’m going, and I don’t ever want to see any of you again”, says Constantine. 7. JLD #9 Jeff Lemire’s first JLD issue is generally another apex of the series. There’s an ingenious example of medium specificity in the scene in which Constantine wakes up with a “truly epic hangover”. A voice says to him, “We need to talk.”, and Constantine answers, “You didn’t spend the night, did you, sunshine? I mean, I was drunk, but I don’t think I was that drunk…” Perhaps it needs to be mentioned that in this series, Constantine is not written as bisexual, so the reader might expect he is talking to a woman. 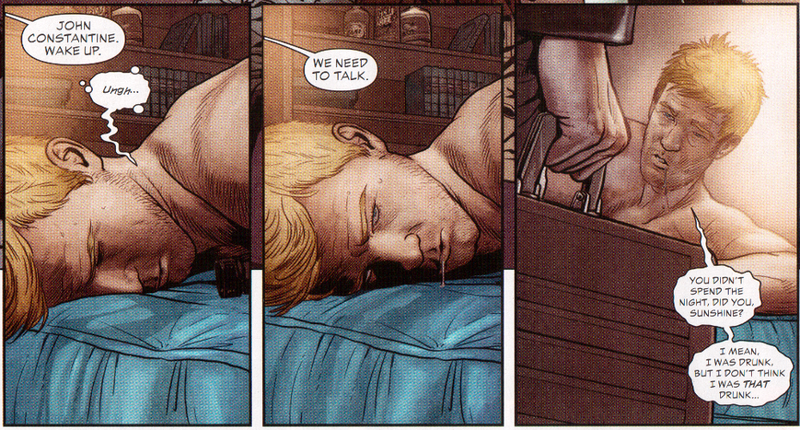 On the next page, the person turns out to be Agent Steve Trevor, who visits Constantine strictly on JLD business. If this was a film, it wouldn’t be half as unexpected, because Trevor’s voice would be recognisable as a male one. 8. JLD #9 Another brilliant display of medium specificity are the gutters between the panels in the same issue: when the JLD enter an ancient Peruvian temple, the gutters are shaped like spiderwebs. This is a kind of foreshadowing, because not until the next page, spiders (well, human/spider monsters) actually appear. 9. JLD #10 A trio of villains, the “Demons Three”, are introduced on a splash page. The way in which they are presented is charmingly old-school: facing the reader, delivering a short monologue, speaking in custom lettering. Throughout the series, beautifully designed villains are depicted in this way, most notably “Black Boris” and “Blackbriar Thorn” in #12, “Blight” in #27, and “The Between” in #32. This ‘Monster of the Week’ pattern, however, becomes tiresome at some point and brings us such underwhelming villains as “Pantheon”, “Pralayah”, and “The Beyond Beyond”. 10. JLD #12 Some more medium specificity: when Doctor Mist says to Zatanna, “I will deflect your backwards magic right back at you”, he turns her speech bubble with backwards speech into a sound effect (in which the letters appear in normal order) which he throws at her. 11. JLD #0 Each New 52 series got a ‘Zero Issue’ in which the origin story was told (similar to the later Secret Origins series, but tied to comic books rather than individual characters). A charming detail of this one (still written by Jeff Lemire, but pencilled by Lee Garbett) is that we get to see how Constantine got his iconic trench coat. 12. JLD Annual #1 Lemire’s story is hopelessly convoluted, but it’s a nice twist when the villain, Nick Necro, tells Zatanna that it was him who formed the JLD in the first place, in order to get the Books of Magic. “You weren’t so hard to get on the team, Zee, but can you imagine how difficult it was to convince anyone to put John Constantine onto a super hero team? I tell you, getting out of hell was easier.” Maybe a(nother) metatextual stab at the concept of the whole series? 13. JLD #14 When Black Orchid explores the House of Mystery (Constantine’s home), she stumbles upon a room in which Constantine keeps files on many superheroes, including Orchid herself. This is a much-needed recap of some of the things going on in the DC universe (in other books mostly). At the same time, it’s fun to see how close Constantine is to revealing the secret identities of Superman and Batman (which the reader is only able to tell through extra-textual information). 14. JLD #15 The JLD is teleported to some kind of magical counter-world in which the JLD members turn into their opposites: the immortal, ageless Madame Xanadu turns into an old woman, Deadman becomes alive again, and Constantine can’t tell lies anymore. The latter aspect becomes relevant for the overall story arc when we learn that Constantine’s feelings for Zatanna are apparently true. 15. JLD #24 J. M. DeMatteis takes over as the new JLD writer, and he takes Constantine on a “Magical Misery Tour” on which he confronts his inner (?) demons. A well-written exploration of Constantine’s character – although one could argue it’s a little out of place in a team book. 16. 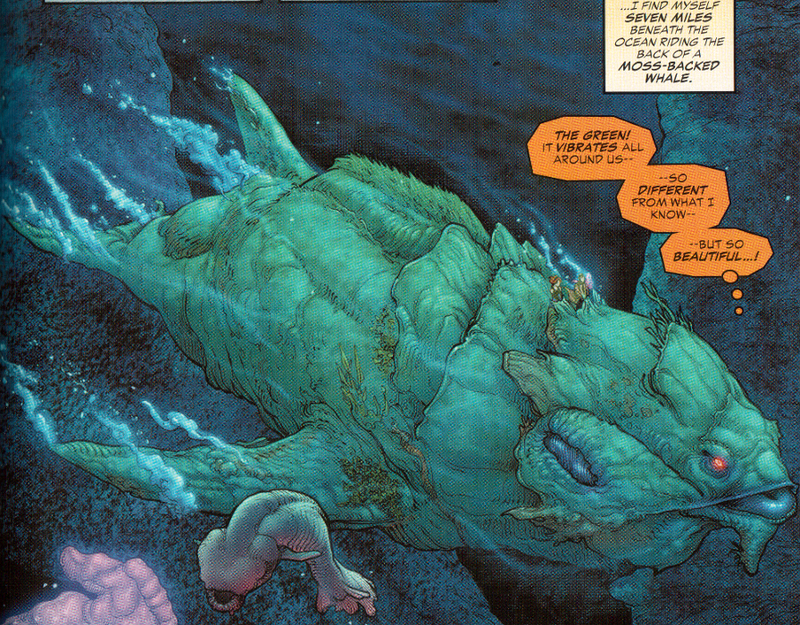 JLD #26 Swamp Thing has recently joined the JLD, and what I like best about him is when he transforms himself, e.g. grows wings. In this issue, he briefly turns into some sort of whale. 17. JLD #27 In order to defeat the villain Blight, who is the embodiment of evil, Constantine and Nightmare Nurse decide to fight fire with fire and invoke the “Blackmare Curse”. This spell “drills down into the deepest pits of the soul… unleashing all the darkness there”, which turns the two into fierce monsters. Naturally, the Curse works better the more corrupted and depraved its evocators are. Thus we are given another little piece of the puzzle that is the true nature of John Constantine’s character. 18. JLD Annual #2 Another interesting spell is the “K’Am’Deva Curse” with which Zatanna rips Constantine’s heart out of his chest so that he loses all feelings for her, and all memories of ever having loved her. The explanation why they do this is that the bond between them acts as a “magical battery” for some supervillains. At the end of the issue the two get separated when Zatanna is sucked into a “whirling hole in space and time” (#35). Things get awkward when they meet again in the final issue. 19. JLD #35 Zatanna emerges in another parallel world in which she meets her father, Zatara the magician, who was supposed to be long dead. Zatara tells her he had found a “doorway through time” through which he took his wife and little daughter with him and settled in a world were “thought itself would instantly become manifest reality” and “no one grows older”. Wait – his daughter? Zatanna realises there’s something not quite right about Zatara’s story… I won’t spoil the ending, but ultimately this story turns out to be a nice version of the old ‘dream within a dream’ theme. On the flipside, this is once again not much of a ‘team book’ story, and it’s too bad the book is no longer drawn by Mikel Janin at this point. 20. JLD #36 Towards the end of the series, an old villain returns: Felix Faust, the ancient sorcerer. Except he is in the shape of a monstrous caterpillar now. I like him best in the cover image (by Guillem March and Tomeu Morey), in which I only saw the caterpillar monster gripping the herous with its tentacles at first, and only later did I spot Faust’s tiny head at the end of the monster. This is probably one of the best JLD covers after Ryan Sook had stopped doing them (#14 was Sook’s last one, I think). A nice rendition of the protagonsits, Lono and Pira, by Rachel Saunders in the online version. Interestingly, this scene is missing from the printed book. Sometimes, it takes little to make a good print comic out of a good web comic (e.g. Robin Vehrs’s Western Touch/Enjambements, reviewed on this weblog). 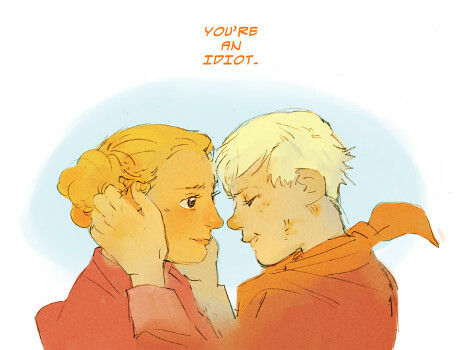 Spera was a good web comic, too, and when its print publication was announced, I was looking forward to it. The concept of Spera was crazy, in a good way: the entire script was written by Josh Tierney, but every 3-8 pages (some of which have large “infinite canvas”-like layouts) the artist would change. Over 40 artists contributed back then, which resulted in a variety of styles, and also in vastly different levels of quality. Sometimes you couldn’t even figure out what was going on in the illustrations if you hadn’t read Tierney’s synopsis at the start of each section. For the print version, it looks like Tierney (or his editors at Archaia?) wanted to have more consistent art, so the same script is now illustrated by only four artists: Kyla Vanderklugt, Hwei, recent Eisner Award winner Emily Carroll, and Olivier Pichard. Don’t get me wrong, all four of them are superb artists, and on average, the art is probably better in the book than in the web comic. However, this printed Spera is no longer a bold experiment in comic-making. It’s just a run-of-the-mill fantasy story. The only element in the story that some readers will find interesting is the gender-bending aspect. Furthermore, the dialogue is often awkward and clumsy (“I want to be my own person, exploring secret dungeons and caves. I want to find things made out of gold and silver and trade them for cool weapons”).